We are pleased to invite you to join us for the 3rd Annual “May Day Waikīkī: Beach Boys, Memories & Music” on Sunday, May 1, 2016 from 12:00pm to 4:45pm on the beach front of the The Royal Hawaiian Waikīkī. 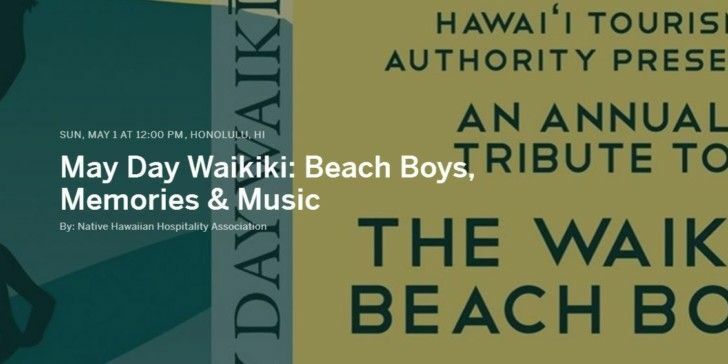 This wonderful event pays tribute to the Waikīkī Beach Boys and brings together visitors and locals for a music-filled afternoon of celebration and reflection. The Waikīkī Beach Boys were known as the first line ambassadors of Aloha, and are attributed with exposing a global audience to the Hawaiian sports of surfing and canoe paddling. It was these jovial and expert watermen who helped to also shape the early tourism landscape and economy in Hawaii. This event is FREE and open to the public however we are humbly asking for sponsorship in the form of monetary or in-kind donations to allow us to continue producing this yearly event. Funds will also be used to begin the erection of a Waikīkī Beach Boy Memorial Wall, which will display the names of the Beach Boys who have passed away and gone “beyond the reef”. We hope that you will be able to attend the celebration and we look forward to hearing back from you!